“However hard I tried to ‘illustrate’ an aspect of the urban environment, to unmask and present how this sleepy, suburban environment ‘functioned’ and fitted together somehow it always failed”. John Myers has been creating artwork for decades. 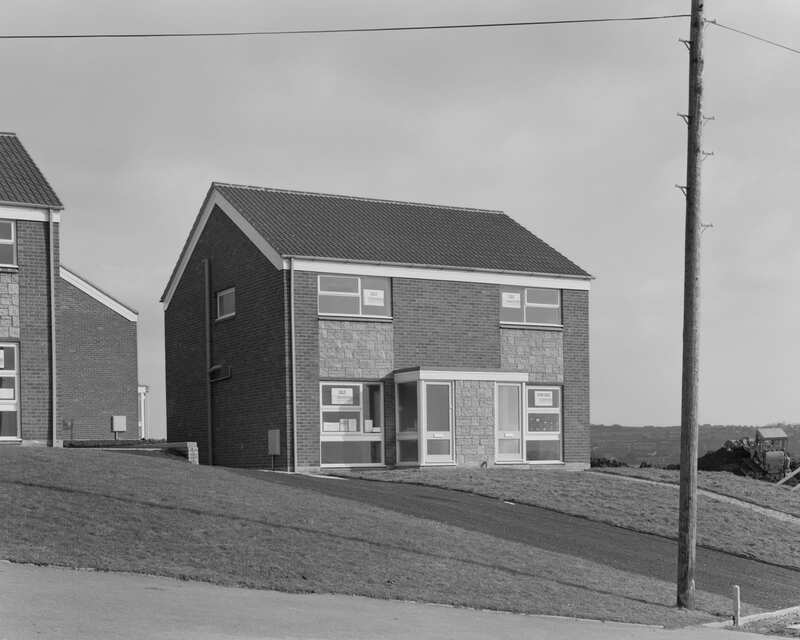 Though his main interests contend with painting, Myers has an incredible archive of photographic images produced in the 70’s and 80’s of life, people and the robust emptiness of post-war and Thatcher inhabited Britain. 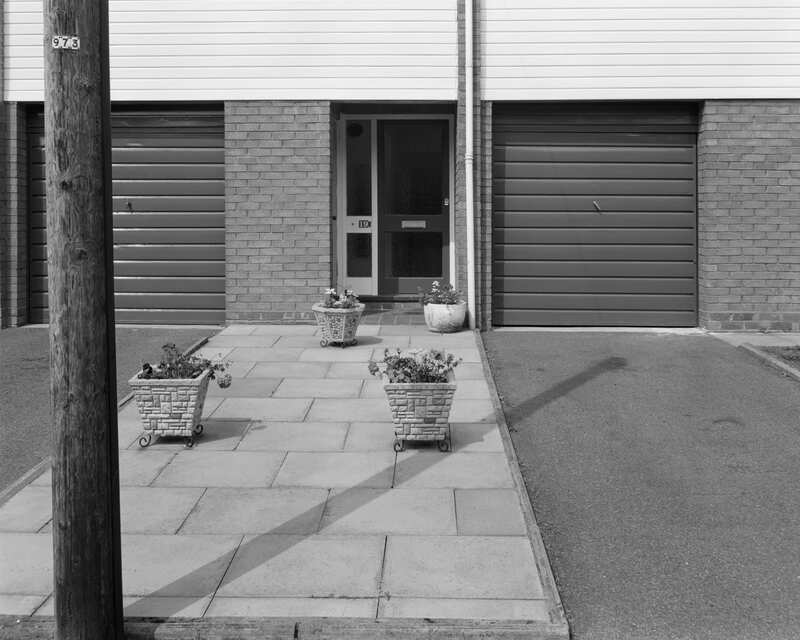 Mostly focused on life in Stourbridge, the images that Myers crafted have an uneasiness about them that was perhaps intentional, but can be implicitly engaged with decades later when given some distance from which to process his empty streets and unsolicited corner images. They have a ghostliness about them, an absence that drives them towards an unspoken profundity. RRB Books has recently released both a portrait book and for the purposes of this interview a book called “Looking at the Overlooked”. The book itself plays on conceptual themes that did occur in movements of minimalism and reduction during the formative years that Myers crafted the material, but its re-examination as a topic is also timely in the now. I do not mind mentioning that it is already top of my books of the year list because I think we only see a book like this once every 4-5 years. John is also no slouch of an intellectual as you will see below. I want to give special praise to RRB PhotoBooks and John for putting out the book, but also facilitating this interview. BF: Deadpan, Banal, Uniformity, And Listless Nothingness. It would be very easy to categorize your work found in “Looking at the Overlooked” as boring. You have used this adjective previously to describe the work and yet, I think we both know that though these may be “landscapes without incident”, that the incidental comes in its completed form in this book and with some years intervening from their compunction to exist and the historical climate that can be analyzed from a bit down the road. I think if we ignore the signature gestures of the book, we would be doing you a disservice. There is a compression of frame and flatness in the grey scale of the images that induced claustrophobia and direct focus. I find this work incredibly pertinent and perhaps subliminal if that were to be a word that we could use. I want to begin this conversation with you about arrivals…not departures…Was this a body of work that you “made” intently or was it a project that manifested itself in the future from the collation of images shot during the years of 1972-1981? Did you intend then to make this a book or has it gestated and just now come to fruition? Can you tell us a bit about how you arrived to the project? JM: There was no project – no check list – no business plan – no written proposal to a funding body (I have never been funded to take photographs) and there were no outcomes planned – no exhibition and no book. Theories about the city, economic interdependence and on a more basic level how we negotiate and make sense of the urban environment are respectable academic subjects. Atget was probably totally unaware of them and Walker Evans, whilst he documented victims of flooding and new housing being built still managed to produce a body of work for the FSA that transcends Stryker’s economic criteria. I was very taken with the notion of the world being made and you may be able to detect that in the series of photographs of houses. 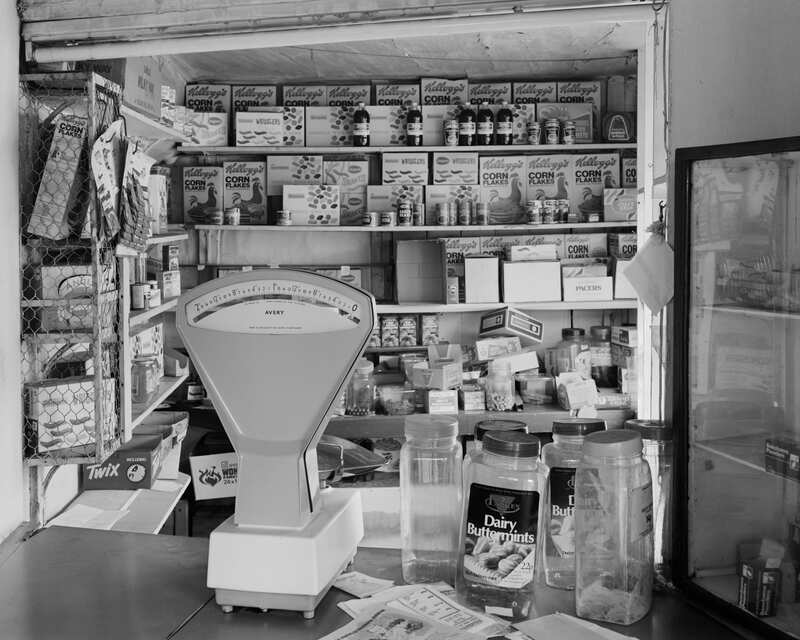 The series of ‘shop’ photographs – particularly the pair – customers view and shopkeepers view reflect that interest also. However hard I tried to ‘illustrate’ an aspect of the urban environment, to unmask and present how this sleepy, suburban environment ‘functioned’ and fitted together somehow it always failed. Maybe the architectural critic Ian Nairn summed it up most eloquently when he coined the term ‘subtopia’ in 1955. 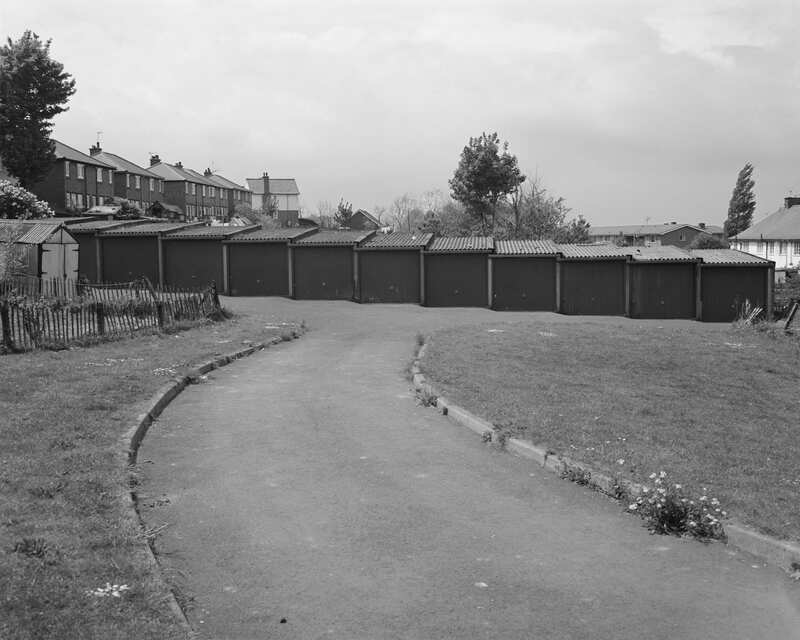 Subtopia, he wrote, ‘is the annihilation of the site, the steamrollering of all individuality of place to one uniform and mediocre pattern.’[i] Eugene Shinkle wrote that ‘the subtopian lifestyle was a mean and middling one: culturally and politically conservative, emotionally impoverished and banal. 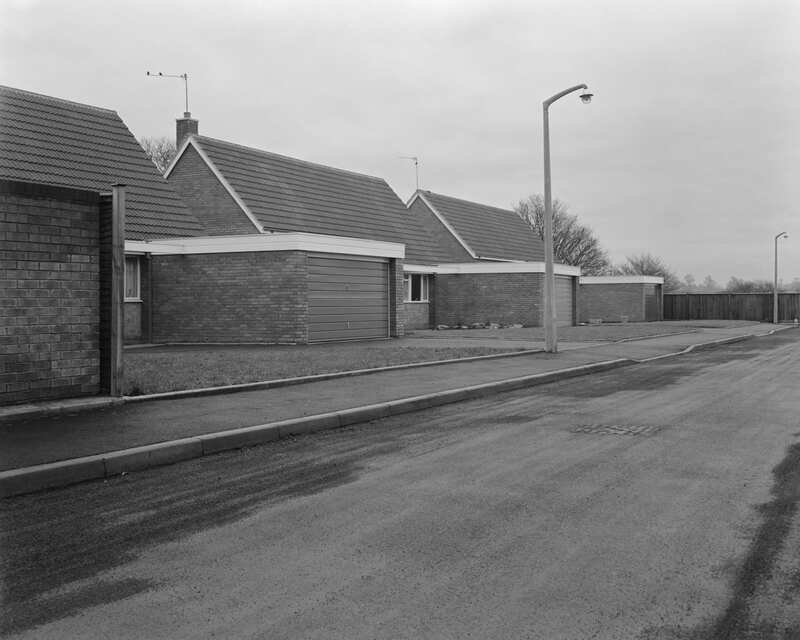 The identical terraced homes, standing shoulder to shoulder on their meagre plots, epitomize the claustrophobia and the stifling homogeneity of the suburban landscape – ‘half-alive towns’ filled with ‘half alive people’ as Nairn commented bitterly. But in the main I could never sustain the regime of taking photographs to fit a certain pre-ordered and prescribed agenda. Whatever I may have read or half understood in Henri Lefebvre’s Everyday Life in the Modern World or the work of the Situationists Guy Debord and Raoul Vaneigem- I continued to go out – see something I wanted to photograph – and then go home and get my camera. Maybe I just accepted the claustrophobia and the stifling homogeneity of the environment. Petrified tree trunks – I can remember my excitement when taking the photograph – but I can’t recall exactly where they were located and Bus Stop, 1975 – where would that fit within an overview of the urban environment pace Atget, Stryker or Nairn? Or would I have taken it with a view to directly commenting on the suburban life style. “The photographs were predominantly taken in flat light that gave imperceptible shade. The angle of view was also important, eye level, nothing fancy, dead pan, taken just as if you were the first person to come across the Dual Carriageway, the Golf Course or the Lift Doors at Waitrose”. Bus Stop, 1975 is published in the volume for the first time. I was a very late comer (2018 in fact) to the work of George Perec and his Species of Spaces, 1974 – I think he may have appreciated the photograph. Influences flit in and flit out – Evans’s cubist compositions with their use of surface imagery and signage had to be resisted – so that within the 89 photographs in Looking at the Overlooked there are changes and tensions. Hope Street, Dudley, 1974 Factory forecourt, 1974 and Tye Gardens, 1973 I personally prefer because they are uncompromising compared to 19 Swincross Road that dates from 1979. The differences are subtle – but detectable. Simple selection gave way, over time, to selection and maybe too much cropping in camera. 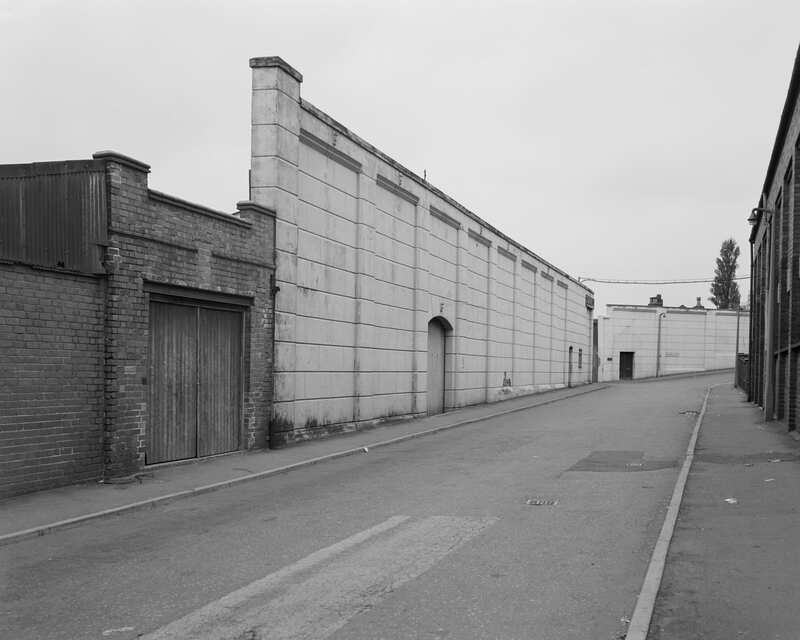 The urban landscapes, sub stations and televisions that make up Looking at the Overlooked were first exhibited and published in 2010. And they were exhibited and published, at the time as series: The televisions, the substations, the boring photographs etc. etc. It made a kind of sense – or at the very least it gave the impression that here was a body of work that had developed through the decade as a series of ‘projects’. The televisions and the Substations were indeed done ‘straight off’ – Television no 1 – 10 almost consecutively and likewise with the thirty or so photographs of substations. But I never regarded them as discreet series. They were taken at the same time that I was taking the portraits, the Furniture stores 1974 and the houses etc. And the group of photographs that have subsequently become known as the Boring photographs span the years 1973 – 1976. 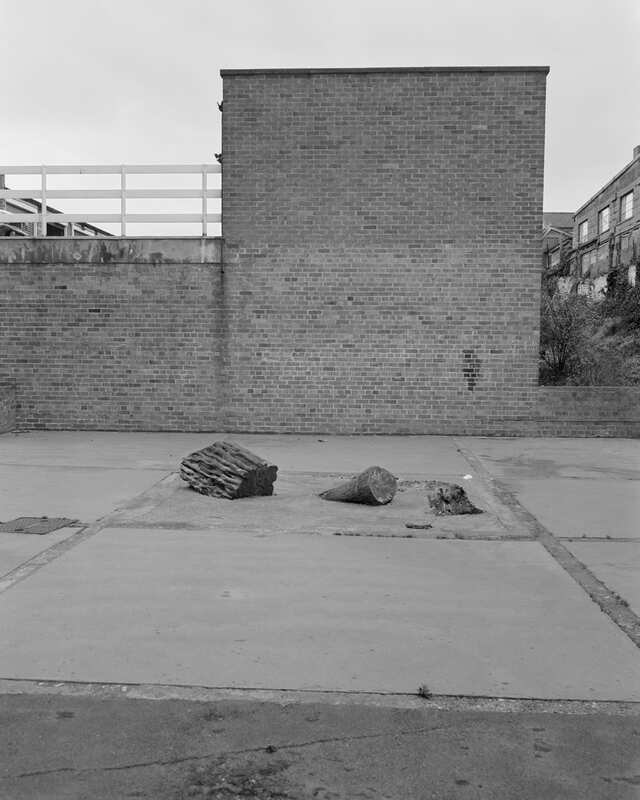 In truth I was unable to ‘fit’ the work together – How did the Furniture store photographs make sense with the Bus Stop or the Petrified trees with the Garages at the top of Grange Road, and how did the Substations and the Televisions ‘fit’ within this body of work. In the spring of 2014, following the show in Dublin I approached Cardiff about the possibility of the work being shown there or at the Cardiff photo festival. They were interested but really wanted, understandably, a different show from the one that had been at the Ikon and Dublin. …and it quickly became apparent that the portraits, which date mainly from 1973 – 1975, tended to conceal what I had really been doing throughout the 1970’s. The remaining urban images, some titled, some with negative numbers only scattered and rearranged themselves on screen almost as if by chance and I suddenly realized that subjects I had been photographing in the early 1970’s, were still being addressed in the mid 1970’s and, albeit in a slightly changed form in 1979 and 1981. I finally knew, forty years later what I had been doing. So rather than being discreet sets of ‘typologies’ or random groups of urban landscapes they began to possess a coherence. BF: You have stated categorically that very few things were influential on this body of work. I read in your interview with Diane Smyth of the British Journal of Photography that you were ahead of the curve when it comes to having this work pigeon-holed as influenced by the American New Topographics movement. 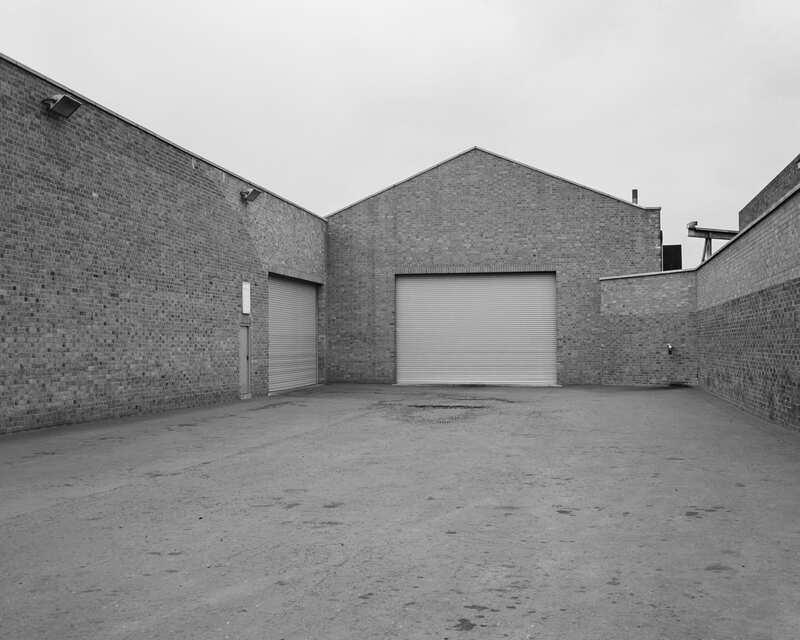 Baltz, Adams, Wessel etc. I see where people might make those associations, but for me, I don’t see it quite the same. I think one has to contextualize a post-war image over that of a New American image. It really has some foundation in what happened in each country the preceding years. 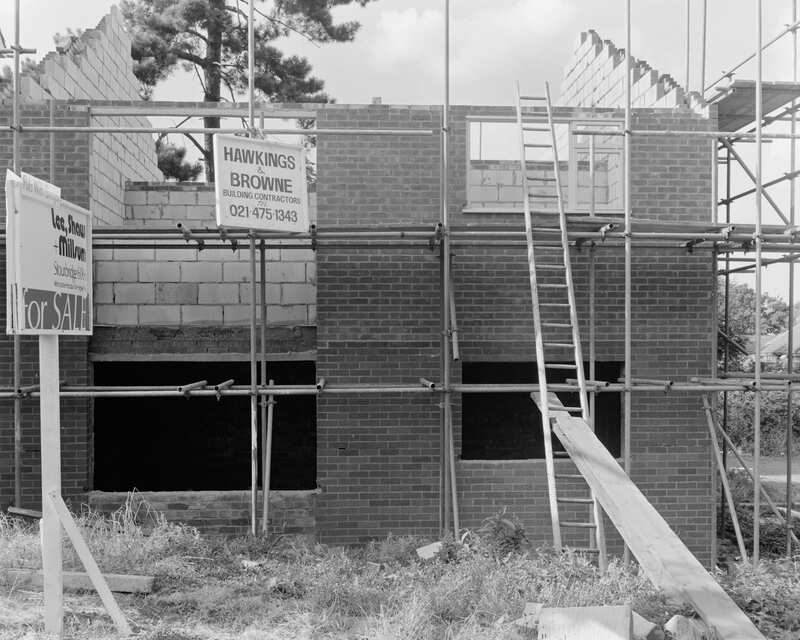 In England of course, when the work was made, you had a number of things in the political background with new build homes in a very old country replacing historic models. You had Thatcherism. You had neoliberalism and new economies forming. You also had pertinent literary culture with authors such as J.G. Ballard writing about the new state of Britain in nearly hypothetical and paranoid terms and not to mention this all existed outside of the M25 in Stourbridge, West Midlands. Can you give me any insight into how you think things may have developed in this manner for you personally? How did you go about finding solace in emptiness (my word)? JM: However much I may, at the time, have admired the skill of Ansel Adams and Edward Weston or the pastoral quality of Fay Godwin – they were photographing another world. When I opened my front door I was confronted by Tarmac (asphalt), houses, a telegraph pole and a substation. The photographs were predominantly taken in flat light that gave imperceptible shade. The angle of view was also important, eye level, nothing fancy, dead pan, taken just as if you were the first person to come across the Dual Carriageway, the Golf Course or the Lift Doors at Waitrose. The absence of people was quite deliberate. There is no hidden story behind these photographs and no event is about to unfold beyond the frame. They are landscapes without incident. The ‘deadpan’ aspect of these photographs does not just refer to the way the images look, it also describes a way of encountering the world. My intention in these photographs was to acknowledge the refusal of this environment to offer a visual or narrative engagement. I never deliberately made a decision to photograph the ‘overlooked’ or the mundane. This is the world I live in. And that was why I photographed it – because there was nothing else. BF: Ring Road Gardens, Errant tree forms, nature at odds with human intervention of home. I find some of the overlooked spaces incredibly taut with a haunting feeling. These small little gardens tucked between concrete garages, the odd tree stump penetrating a small square of sandy soil on the pavement. There are these incongruent elements that seem to be at odds with one another in some of your images-they almost become stand-ins or portraits of their makers or of the community that is exempt from the frame. Was there any emphasis on your part for making these associations that I am exploring? Are there portraits within the spaces themselves? Why this drive to eliminate actual people? JM: The people are in The Portraits. And the portraits were not a separate ‘project’ – I was taking the portraits at the same time as I was taking the Ten Televisions, 1973, the Substations, 1974, the Furniture Store, 1974 and the series of photographs that became known as the Boring Photographs. 1973 – 197? The absence of people was quite deliberate. But why would I include pedestrians, or children playing in the street in a photograph of a house, a substation, Ring Road gardens, etc. Introducing figures would add a narrative and turn the photographs into ‘conversation pieces’. The ‘associations’ that you refer to (that) ‘almost become stand-ins or portraits of their makers or of the community that is exempt from the frame’. Remember that the Lift Doors Waitrose, 1975 is not a special place, no crime (so far as I am aware) occurred here and no event is about to unfold from beyond the edge of the frame. The image can be summed up in one short sentence: This is a photograph of the lift doors at Waitrose. BF: You famously gave up photography for painting some time ago, so I would not hesitate to venture that your work, its minimal form, the focus on the cube in particular has its roots in minimalism. Were you consciously applying that to the landscapes when you were making work? I get the sense that photography and photographers may have been important for you, but that what was happening at the time in terms of painting was and probably remains your favored muse? JM: I think it is a mistake to see some of my work as being overly indebted to minimalism. The lift doors at Waitrose themselves are of a ‘minimalist’, functional construction. Photographed ‘straight on’ the double doors of the elevator might resemble work by Jo Baer. Lift doors at Waitrose exist in space – you are about to encounter them for the first time. © John Myers /RRB Publishing. Looking at the Overlooked. Published 2019. Robert Rauschenberg – photographer, performance art, print maker, collagist, sculptor, painter. Richard Hamilton, Painter, typographer, photographer, printmaker, exhibition designer, recreator of Duchamp’s Large Glass and a typographic version of Marcel Duchamp’s Green Box, The Bride Stripped Bare by her Bachelors, Even. BF: The titles of your publications are either humorous or deeply threatening to the mythology that we have come to create around photography-Looking at the Overlooked (2019) The World is Not Beautiful: 1973-1981 (2017), and also (somehow inexplicably when I reference your work) the book on Edgerton Seeing the Unseen, the High speed Photography of Dr. Harold E. Edgerton (1976). The titles speak about looking and also about the (gasp) imperfect and un-attractive side of seeing the world for what it is. It is as though there is a complicit play happening between how you view photography or its consumers and the act of looking itself. How conscious is the decision to speak about the fundament of the un-exemplified image when making your books and how did you come to publish Edgerton? JM: Making the ordinary, extraordinary, has become so widespread that it is no longer possible to ascertain which ‘world’ is being photographed. Missing out the ‘boring bits’ can be a Sisyphean task. As Eve Arnold said, ‘It’s the hardest thing in the world to take the mundane and try to show how special it is’. There’s no denying that spectacles do occur (occasionally) and that the remarkable is exactly that – to be remarked upon – but on a daily basis and in every way? Straining out the mundane, in an endless quest for the ‘special’, diminishes and devalues the everyday. Maybe Eve Arnold spent so much time trying to make the everyday look special that she overlooked the bigger challenge – to take the mundane and try to show how boring it is. RE: Harold E Edgerton. I came across a photograph in Camera by Edgerton of a humming bird hovering and feeding from a pipette. I was familiar with his golf swing and the milk drop photographs from Beaumont Newhall and was excited to discover this additional work. So I wrote to him at MIT and suggested, since I could find no evidence of him having shown in the UK that he might consider an exhibition in Britain. BF: I’M going to blunt here…there are images in this book that I just cannot see being made…ever, let alone when they were and THEY WORK…the golf course flag, the elevators, the bus stop, the scaffolding. There a number of really confounding images. How does one come up with taking those images? Is it flippant? Are you using the large format for images like that or is it from a smaller 35? I can understand when film was a bit cheaper-the exercise of chance with making an image like that, but I do not understand how you get there with intentional large format. Can you give me some insight into how you find these fragments, these passages of observation and execute them? 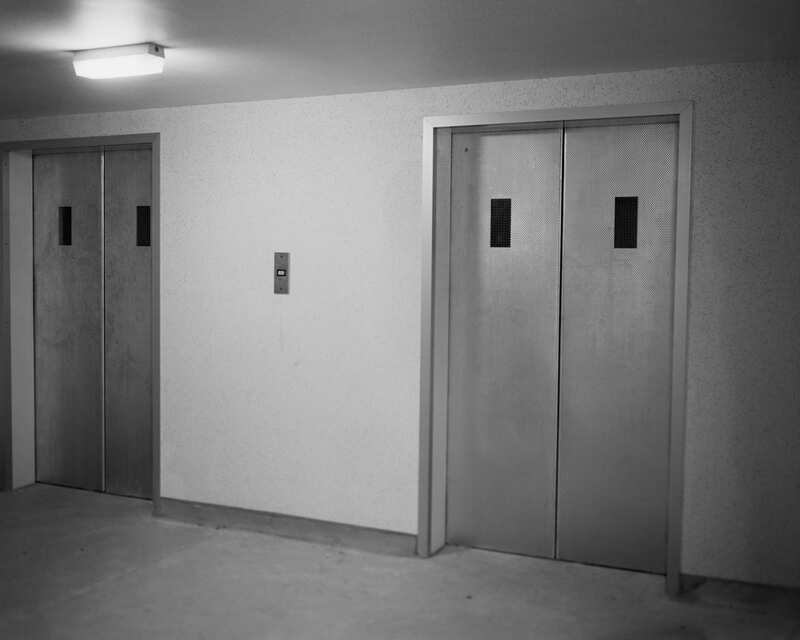 Are you overly active or drained of thought (as in meditative, not thick) when you make an image like the elevator or interior or Job Center, 1975 image? JM: All of my photographs were taken using a 5 x 4 Gandolfi camera. I never went out looking for things to photograph – I don’t go with the idea of the photographer as a hunter. And – and this is important – none of the images are cropped in the darkroom – I took the photograph – and in the successful ones got it right first time. The process was not based upon chance. The Substations were all shot on the basis of one 5 x 4 negative per subject, similarly there are only ten negatives of the Ten televisions. 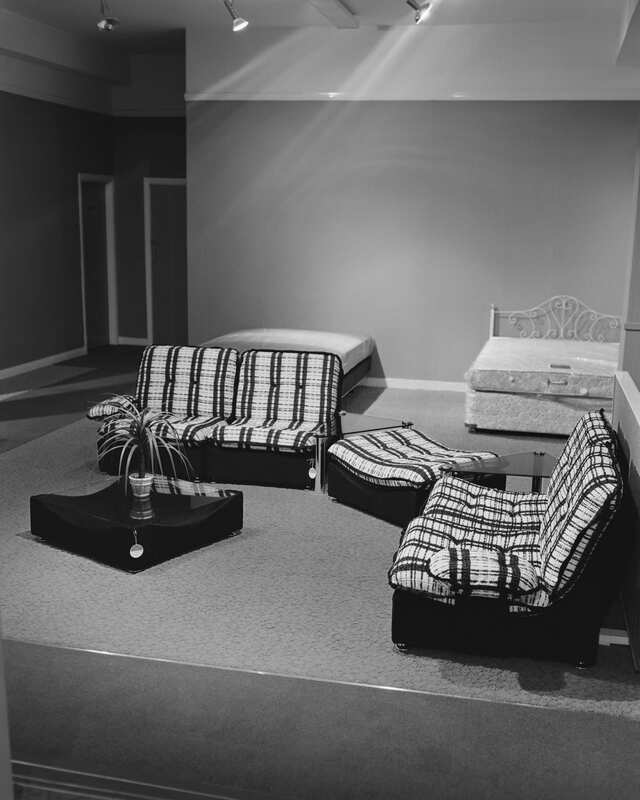 The Furniture Store, 1974 (there are 3 published images in Looking at the Overlooked) – 6 negatives. 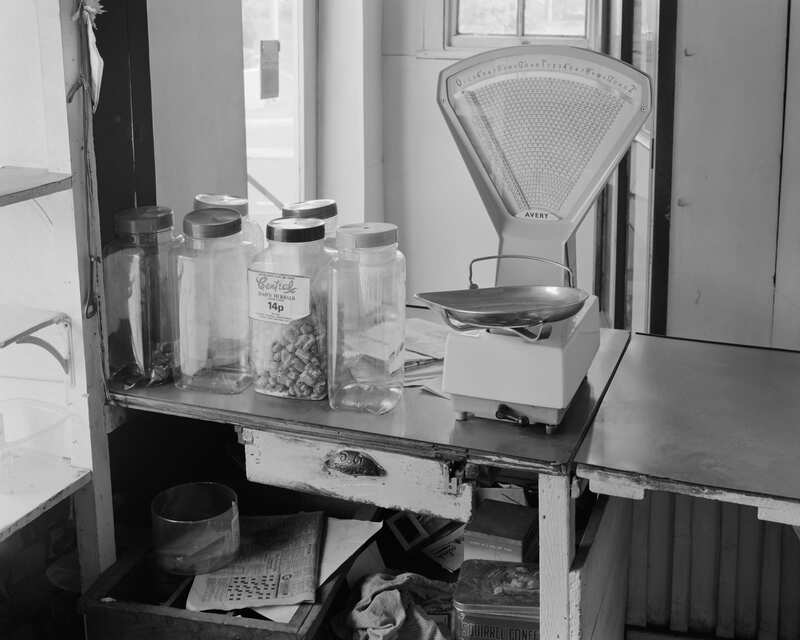 One negative was processed separately and was used to establish the processing times. That was my modus operandi. Negative size in all cases was 5 x 4 inches and if I printed the image it was printed to 10 x 8 inches. 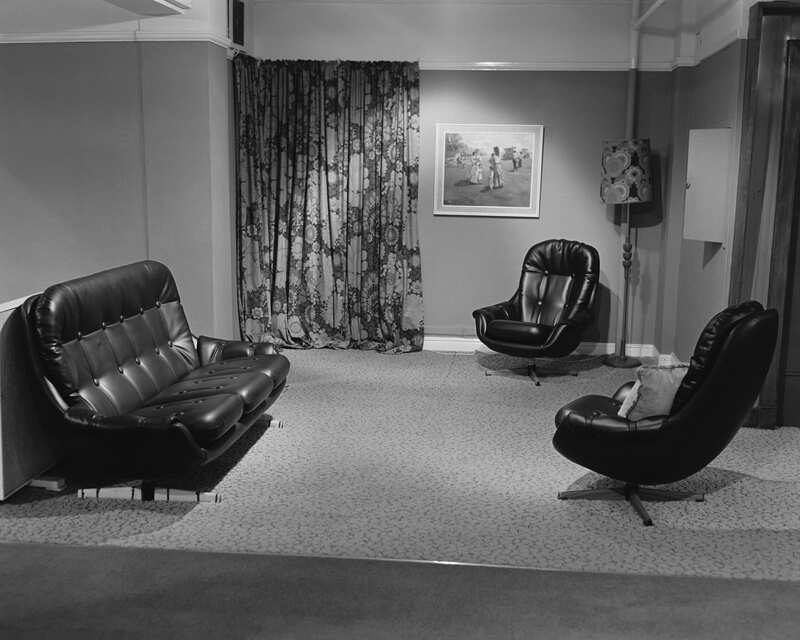 It never varied – so I had a complete understanding and feel for the space that I was working with. The space in the photograph is key because it indicates exactly where I am in relation to the subject. Cropping and editing the final image are not part of the process because to edit and ‘focus’ on to a part of the image replaces a spatial relationship with one which is very often predicated upon composition and the ‘look’ of the photograph. 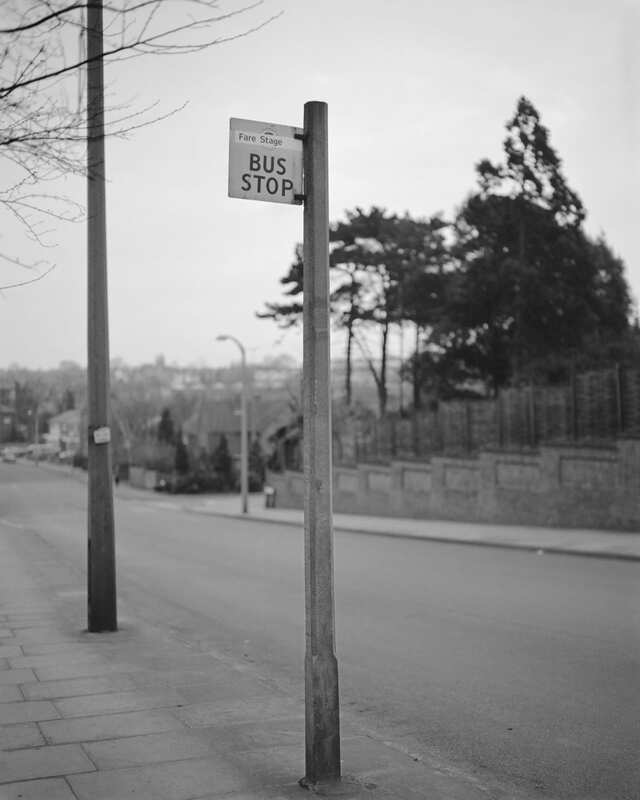 The Bus Stop – it excited and shocked me when it was first printed for the book Looking at the Overlooked in around 2017. It’s so obvious – that it just disappears – a picture of a place to wait…for a bus. BF: There seem to be a few series happening in the book. The Substations being the first point of discussion. -How did you get to those? I understand that most of the work was made while close to your home or within reach, so I would speculate that the works were there waiting for you to activate them, but how did you get to these strange hinterland structures that hide important function in a rectangle of brick. JM: I really had no career investment in photography. Of course I showed at Serpentine 73 in London and featured in the Arts Council publication British Image 1. But I never felt as if I had a trademark of a certain kind of photograph or indeed even a specific set of subjects. And of course I was physically somewhat isolated away from London. Looking back it gave one an enormous freedom – there were no rules – no fixed and established genres to adhere to and, more importantly, so few people were interested or aware of the work that I was producing. I devoured as much photographic imagery as I could but my movement across genres and approaches was intuitive. I never felt constrained to produce a ‘body of work’ – why would I want to photograph beds (plural). 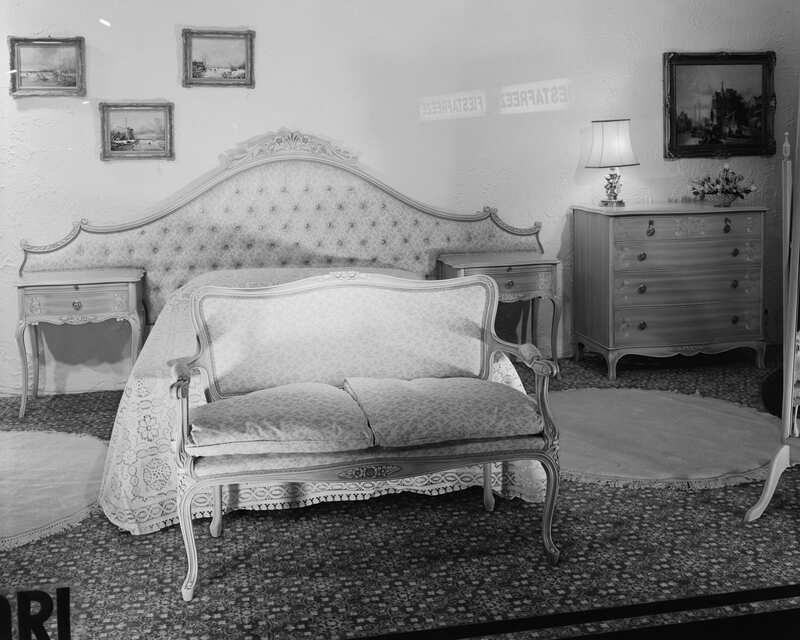 The Bed is titled in capital because it is The Bed – I didn’t feel the need to produce a whole gallery full of them. And who at the time would have been interested? BF: One other series to discuss is the interior of the stores. The local shop being another strange piece of the overall puzzle for reasons that, at the time of it being made, I cannot foresee why you would commit to a photograph of a local shop like this. The sagging shelves, and cereal boxes vexing the observer with their banal forms of consumption. I like to think about the war here and not in a Fawlty Towers sort of way, but perhaps the nostalgia of your youth and the idea of availability etc. factors in, but my lurking suspicion is though that might have been a part of it, we are probably also discussing the temporal nature of images-what I mean by this is that when we photograph, or when one photographs rather, the complex nature we have (especially with film) is how to discuss when it will be viewed and for what purpose. So for example, the local shop shelves-I have a sneaking suspicion that sometimes when a photographer makes an image he/she is not making them for the present, but rather the future to look in on the past. This is most evident in the 19th century I think when photographers like Fenton would cover the war in Crimea or Charles Marville or Baldus the post-Haussmann streets of Paris. There is a sense that the images were made for somebody later on to remember something or someone that would be in transition towards disappearance when they viewed the image in the future. Do these images have that potential or was there any sort of “I must remember or they must remember” intent? 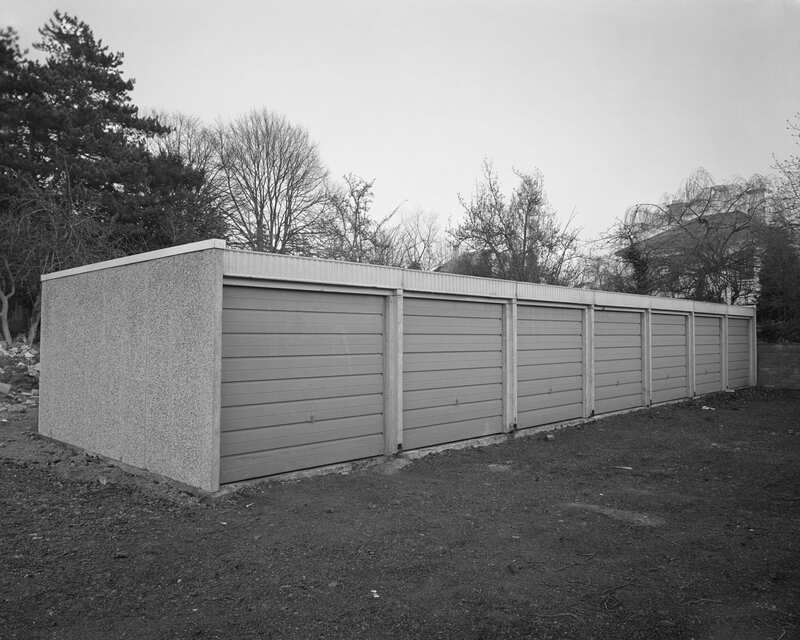 JM: I have never regarded the photographs as being ‘documents’ of what Stourbridge looked like in the 1970s. The photographs were not intended as views. I am not interested in any historic dimension others seek to impose on the work or in the quirks of details or aspects of the time that viewers often alight upon. Whilst some of the shots are identified by place name: Tye Gardens or The Labour in Vain this was solely for the purpose of negative retrieval. I prefer to see them as generic and not site specific. 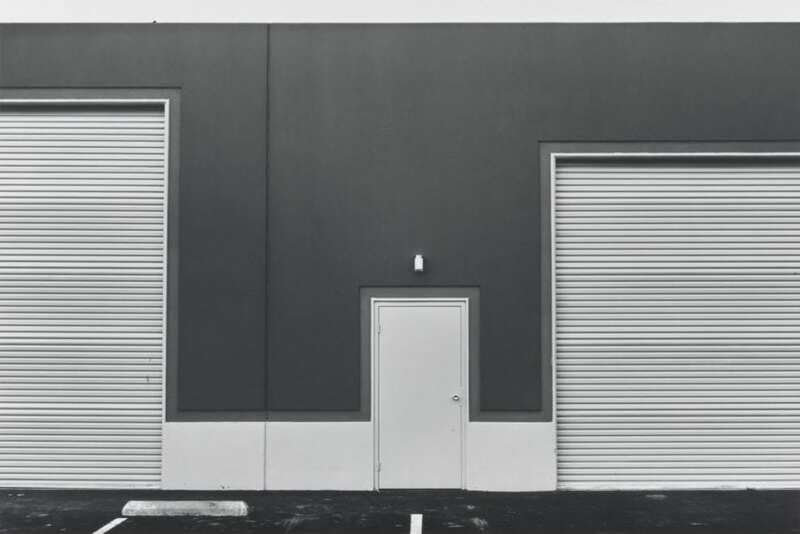 The photographs present the backdrop to the mundane and the everyday. The backdrop is still there and it is almost unchanged. The lift doors at Waitrose are somewhat grubbier and some of the shops in the High Street are still empty and now have the homeless sheltering in the doorways at night. The Golf course is unchanged save for the pin being moved and some of the trees in these photographs have disappeared, and there are more cars now parked on roads and driveways. I didn’t take the photographs of shops so that they would be remembered – I took them because I went into shops to browse and buy. They were – and still are – a part of the world that I live in. BF: Finally, the interiors of the furniture stores. What appears as a living room of a friend’s home etc. is in fact staged tableaux executed in order to sell the dream of home living. If you had not titled it, we would have missed the image’s function and that in terms does speak about “the real” the simulation of home life etc. Were any of these thoughts part of the game of making these images? BF: And finally, the televisions. All of these images towards the end of the book are pointing in a sort of George Romero “Dawn of the Living Dead” motif in which our compunction to buy our future, our dreams our lives are at the crossroads of what is being offered in materialism. The television, the great opiate of the second half of the twentieth century is certainly (now the internet) the means by which capitalism expanded in borders along with neoliberal tendencies in the home. When is a TV just a TV? JM: It’s apposite to reference the science fiction in respect of the Ten Televisions. I usually mention the Day of the Triffids (1951) by John Windham. Certainly there is a sense that the TVs have just arrived from another planet and settled themselves into the corner of the living room. The Ten Televisions may well be the first typology of the new age. Becher’s gasholders, water towers and colliery winding towers, even in the 1970s, were taken at the point when they were about to become industrial archaeology. Monuments to industry that had been spawned by the industrial revolution of the 18th and 19th century. It was not evident, even in 1973, just how central the screen was to become by the 21st century. The beveled TV screens make me think of Buzz Aldrin’s visor on the first moon walk in July, 1969. And is it too fanciful to think of the reflections in the screens themselves as referencing, in ever so slight a way, the image of the artist in Jan Van Eyck’s, Arnolfini Portrait. The interiors themselves often evokes responses ‘Oh I had an action man like that’ – or a comment about a gas meter protruding from a wall. Invariably someone asks, ‘why did you photograph televisions? It is a strange question when so many of us now look at and relate to the ‘real’ world via a screen. Nairn, Ian (1955). ‘Agents’, in The Architectural Review vol. 117, no. 702 (Special Number: ‘Outrage’, June 1955), p371. Posted in Feature, Interviews and tagged 1970s phtotography, 1980s photography, Banality and Photography, Brad Feuerhelm, Britain and photography, British photography, Charles marville, Eduoard Baldus, Eugene Atget, Eugenie Shinkle, Eve Arnold, George Perec, Guy debord, Harold Edgerton, jo baer, John Myers, Looking at the Overlooked, New Topographics, Photography, Photography Interview, Raoul Vaneigem, Robert Rauschenberg, RRB Books, Species of Spaces, Stourbridge, Subtopia, Thatcher and photography, The world is not beautiful, Tony Ray-Jones.